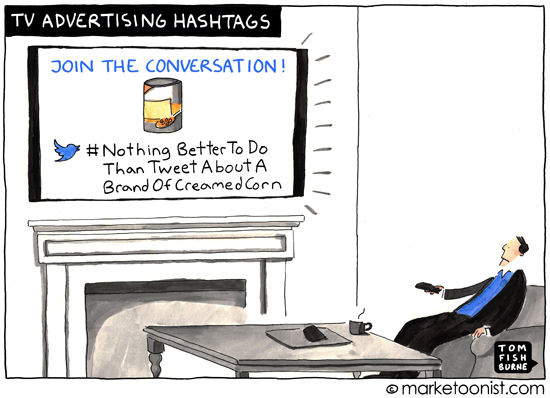 Marketers have gone hashtag crazy. Beyond Twitter and Instagram, Facebook recently incorporated hashtags into its platform. Hashtags are appearing in TV ads and on packaging. Some marketers are referring to hashtags as the new URL. But there’s a fundamental difference between hashtags and a URL. 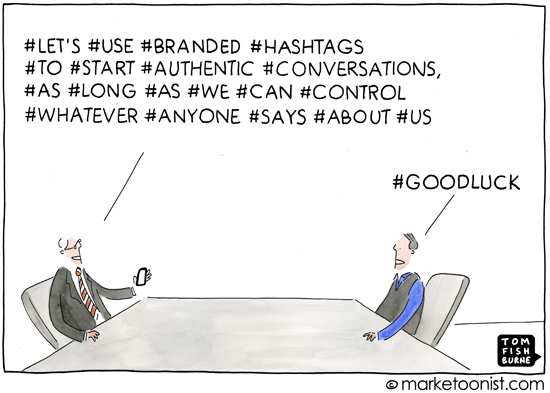 Brands aren’t in control of hashtags. JPMorgan Chase discovered this the hard way a couple months ago when it scheduled a live Twitter chat with the hashtag #AskJPM, inviting people to submit questions. The hashtag quickly started trending, but not for the reasons JPMorgan expected. It’s the same lesson that McDonalds famously discovered with #McDStories two years ago (which quickly devolved into snarky comments about Type 2 Diabetes and how McNuggets are made). 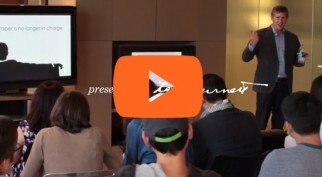 When consumers are invited to talk about a brand, they’re not always going to say nice things. Marketers refer to this phenomenon as “Hashtag Hijacking”, but that’s a misnomer. Hijacking implies that brands own the hashtag at the start. Unlike traditional marketing messages, brands can’t script the narrative. Brands can spark conversations, but they can’t control them. 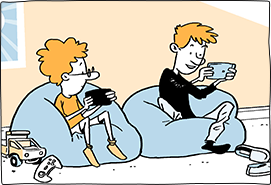 Here’s my cartoon inspired by the hashtags in TV ads in last year’s Super Bowl. Social media allows brands to start conversations, but are they conversations worth starting? A very interesting topic, and very current! I think you’re totally correct in what you are saying. For big brands they have to see it as the other way round. Instead of trying to start a conversation, they should participate in the conversation that’s already taking place (if there is a conversation already taking place – if not, then that probably speaks for itself…no pun intended). 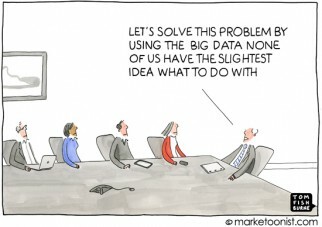 Marketers for big brands (a lot of small businesses doing this too) are still trying to ‘push’ their message out their. They are doing it all wrong…it’s hard to believe that they haven’t caught up yet. They need to get better at humanising their business, communicating and engaging with customers, clients, prospects (or whatever) as humans. It’s almost like businesses don’t belong on social media – a bold statement perhaps. 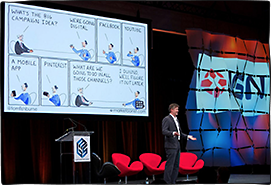 How can businesses start communicating and engaging like humans? Perhaps a topic for further discussion. Thanks for writing your article Tom. 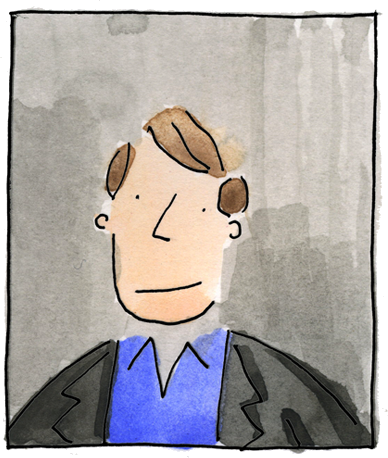 Hi Tom – you very accurately highlight marketers continuing to ignore another fundamental marketing principle. We should put legal ownership to one side, and marketers should have the mindset that they don’t own the brand, consumers do. Any marketing communication therefore requires permission from the owners, so beware of the consequences if you don’t have it! There is a lot of hype surrounding social media…and it is easy to get carried away when seeing the statistics on how many people that have potentially seen your tweet etc. The reality is that social media is not a very good marketing channel for most businesses – especially for driving sales. IMHO, the only way a company should use social media is for customer service to interact with existing customers and possibly by marketing to experiment with #hashtags to get a little exposure. 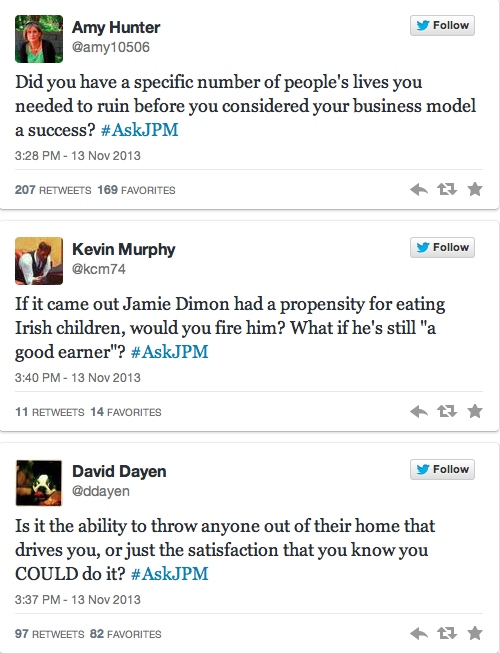 You could say that the AskJPM example above shows how things can get out of control. But you could also argue that it is a good opportunity for customer service to address disgruntled customers – on a medium where it is soon forgotten again.. Yes, it may not look pretty, but the twitter memory is short and bad pr is still pr…. I’ve always wondered why brands are so keen to get social media exposure (with hashtags or otherwise), when as you mentioned the risk of getting negative publicity is very real – and on an equally large scale!! Wouldn’t they be better off investing their time and efforts in more safe traditional media or better yet in improving their product and the user experience (which will get users talking!)?? I also like that the fact the cartoon illustrates another problem brands have which is hashtagging every other word whether or not its related to their brand or not. Which brings me back to my original point of wanting exposure as opposed to conversation. They want people talking about them, but they won’t engage in any meaningful conversations, and they run the risk of the conversation going sour. I’ve just read Gary V’s Jab Jab Right Hook, which does a good job of demonstrating how companies can piggy-back on a trending hashtag, as Oreos have done with great success. A good read on Kindle. Bo makes a great point above that conversations on Twitter are intense, but like yesterday’s newspaper being used for wrapping fish and chips, blow up into storms and pass over extremely quickly. When companies provide good customer service and respond quickly on Twitter, affection for their brand can drive many RTs. Innocent Drinks are a great beneficiary of affection, and use their tweets to amuse and entertain their followers with topical content. Occasionally they add a product update or something about the Innocent Foundation and their most recent advertising campaign, Chain Of Good, which shows how Mark in the UK buying a smoothie can allow a boy in Africa to pay for his education. I personally avoid hashtag use as much as possible. It’s amazing how big brand marketers can be so tone deaf about the negative perceptions of their brands that they don’t realize when they’re giving their detractors a stage to mouth off. I love Chris Marr’s comment about participating in ongoing conversations rather than trying to start one. Such a great point! Nature (in this case, a natural reaction) has a way of taking over the artificial (your hashtag). @Paul – while I realize that some of the brands are getting out of hand with the gluten free labels, for the most part, for those of us that need it, the movement is a godsend. You don’t really realize how many everyday things contain gluten that you wouldn’t expect. For example, soy sauces, fruit snacks, and imitation crab are things that many people don’t understand have gluten ingredients in them and since I have celiac, I can’t eat them. I could talk about this topic all day, but since this is Tom’s blog, I’ll go back to what he was posting about. @Tom, I think the JPM and McDonalds hashtag incidents are great examples of when people are locked onto the “cool” of a thing and not really the logic behind using it. If I were a betting woman I would be willing to bet that there was an executive there who said something along the line of “Hashtags are cool. We should use hashtags. Do a campaign.” with little thought to what would actually happen. I still find it kind of bizarre that anyone would want to “interact” with a brand anyway. If I want to interact with Chase, I go to the bank and say hello to the teller. If I want creamed corn, I go to the store and buy some. Why would I want to talk to the can? I think that’s why these brands are struggling so much – how do you personalize a brand? The most successful brands that have done it are Oreo, Innocent, and Method, and that’s because their social media brand is all about smart, sassy people living lives with their items, not as the item in question. Another fabulous example of how ridiculous (and useless) hashtags can get – and have become – can be seen almost monthly with Stephen Colbert. He is not only a master of sarcasm and ridicule, but has an enviable 5.6+ million followers on Twitter! When Stephen starts a hashtag, it’s typically to scoff at someone or something, yet people respond in droves to his dippy observations because they appreciate his making fun of people and companies who are so desperately screaming for social media attention. He’s also a master of social media, due to his wit in calling out those who take themselves too seriously. Hashtags are the latest example of a web tool that becomes trendy and gets used indiscriminately. Another scalpel used as a chain saw. Another “see we’re modern, we have all the modern tools” waste of time and effort. They join blogs, live chat, QR codes, Twitter feeds and a score of other over-used and under-understood tools on the Island of Misfit Solutions. Unfortunately, the over-use weakens the tool for folks using it appropriately. Love your stuff, Tom. Keep up the good work. Marketing is better for it.